A gas-lamp mystery featuring Jack the Ripper, Arthur Conan Doyle, Harry Houdini, Cthulhu, Mina Crandon, Mary Jane Kelly, the Cottingley Fairies, and a cast of thousands! "I knew, as everyone knows, that the easiest way to attract a crowd is to let it be known that at a given time and a given place someone is going to attempt something that in the event of failure will mean sudden death," - Harry Houdini. An exhilarating romp through Victorian London and 1920s Boston, as fact and fantasy are merged, moulded together, and then torn apart again all for your entertainment and delectation! 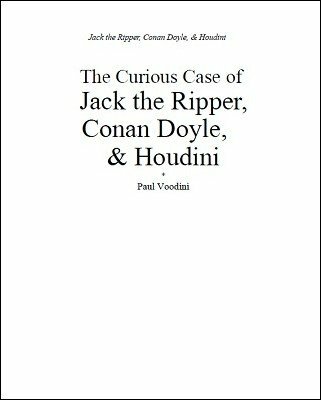 By combining genuine newspaper and police reports of the crimes of Jack the Ripper with fictional drama, Paul Voodini takes us on a journey from Whitechapel to Bethlem mental hospital, and from Cottingley in Yorkshire to Boston in Massachusetts, along the way meeting such larger-than-life characters as Arthur Conan Doyle and Harry Houdini. What secrets lie hidden in the minds of Houdini and Conan Doyle? And what is their connection to the terrible crimes of Jack the Ripper? Set to the backdrop of a fictional dinner party hosted by the celebrated medium Mina Crandon on the eve of her abilities being tested by a committee from the American Scientific magazine, the truth is slowly revealed, the identity of Jack the Ripper becomes known, and the motivation behind his awful crimes laid bare. And where, in this bizarre jigsaw, does the monster known as Cthulhu fit? Please note that this is a work of fiction, and as such no tricks, routines, or presentations are featured! Also be aware that this novella features historical characters such as Houdini and Conan Doyle in totally fictitious scenarios and gives them fictitious personality traits and attributes. Please do not purchase if you think this may offend you. 1st edition 2015, 117 pages.